It’s always a big ask to transfer all the virtues of larger, more expensive luxury vehicles to smaller, more affordable ones. The best example is the burgeoning luxury-small-crossover segment, where so many models disappoint because they just don’t feel very luxurious, lacking the style, refinement, driving poise, or features of other models in their company’s range. So the 2019 Volvo XC40 is hugely refreshing because it actually does feel just as nice as Volvo’s XC60 and XC90. 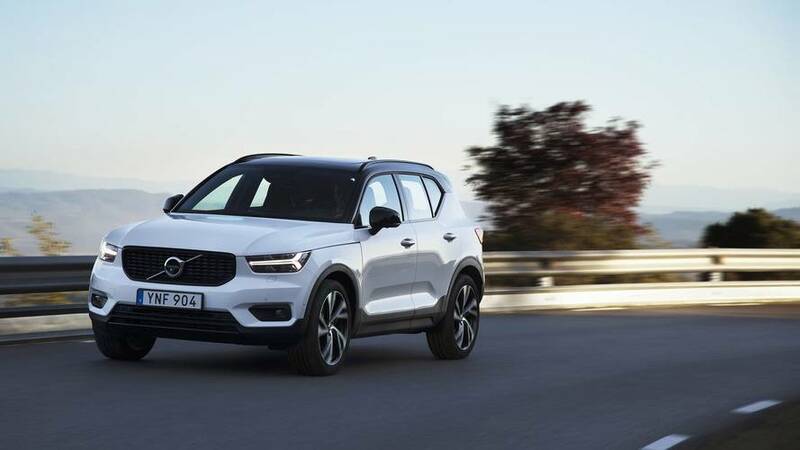 Volvo describes the XC40 as a “cousin” to those models rather than a “sibling” because the new crossover is not simply a scaled-down version of the XC60 and XC90. The design brief was to build a “tough little robot,” a dorky but apt descriptor when you see the XC40’s squat stance with the wheels pushed out to the far corners. 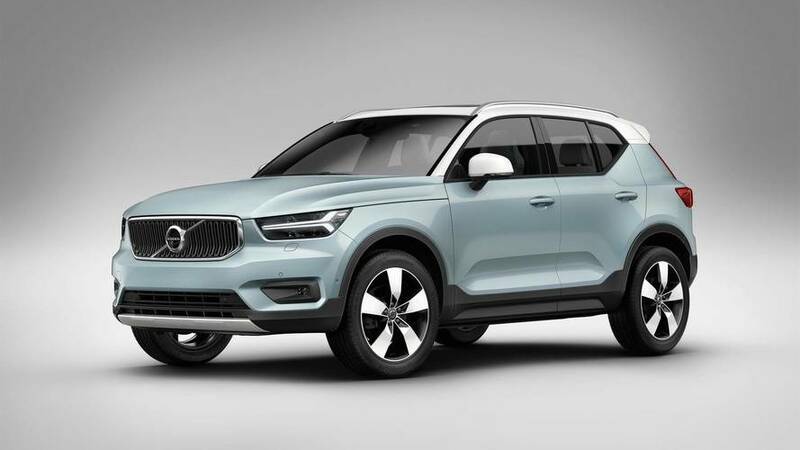 The first car on Volvo’s Compact Modular Architecture (CMA), the XC40 is a not-too-compact 174.2 inches long and 65.0 tall, with a healthy 8.3 inches of ground clearance. A sharp clamshell hood starts off the taut design, while the body sides are devoid of modern cars’ usual shoulder lines and instead are accented by a “light catcher” at the bottom of the doors. The beltline kicks up sharply at the back of the rear windows, and there’s a big spoiler above the otherwise relatively spartan liftgate. 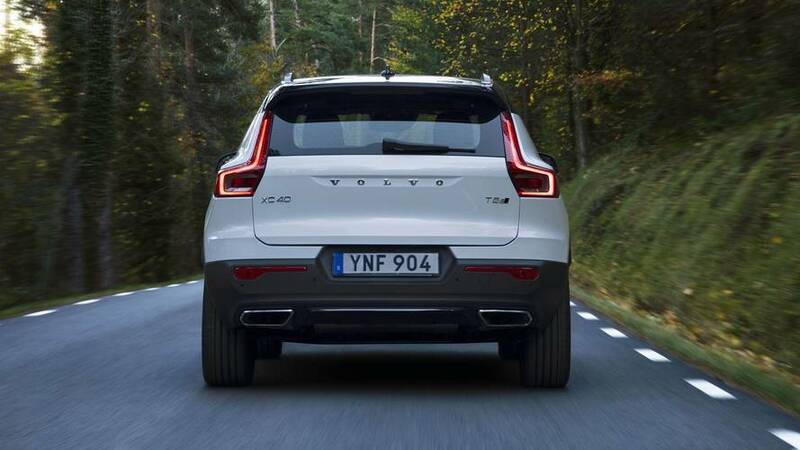 Variants on Volvo’s “Thor’s Hammer” LED running lights and L-shaped LED taillights help identify the car from a distance in traffic. 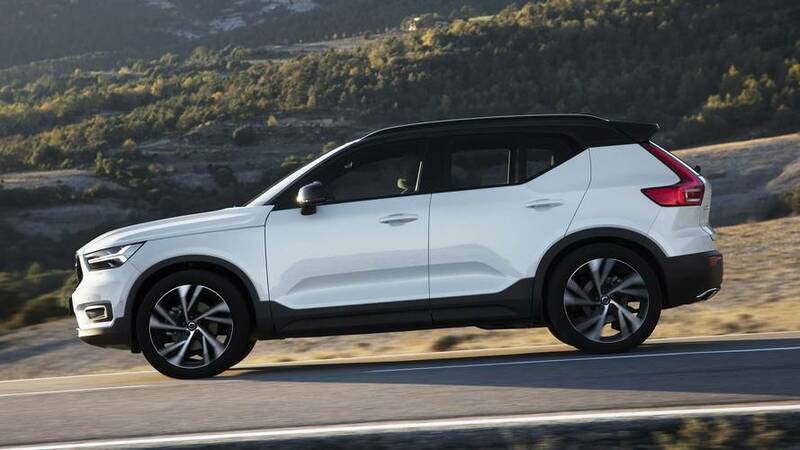 The first car on Volvo’s Compact Modular Architecture, the XC40 is a not-too-compact 174.2 inches long and 65.0 tall, with a healthy 8.3 inches of ground clearance. White the optional white roof on base models or the gloss-black roof on R-Design trims, there’s even more street presence. The only bum note is a small piece of plastic on the C-pillar; it’s there to cover the paint transition between body and roof, but it produces annoying lines that you can’t unsee once you notice them. A little rubber Swedish flag sticking out from the hood shutline is a cute touch. 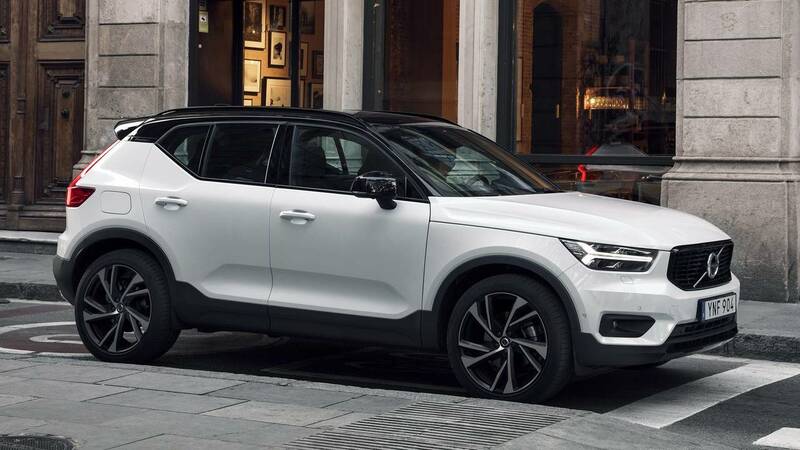 It’s only planned to be fitted to the first 5,000 XC40s sold globally, although Volvo is considering whether to expand that if it proves a hit with customers. The flag was first implemented on the Volvo 40.1 concept that very, very closely previewed this production model’s look. 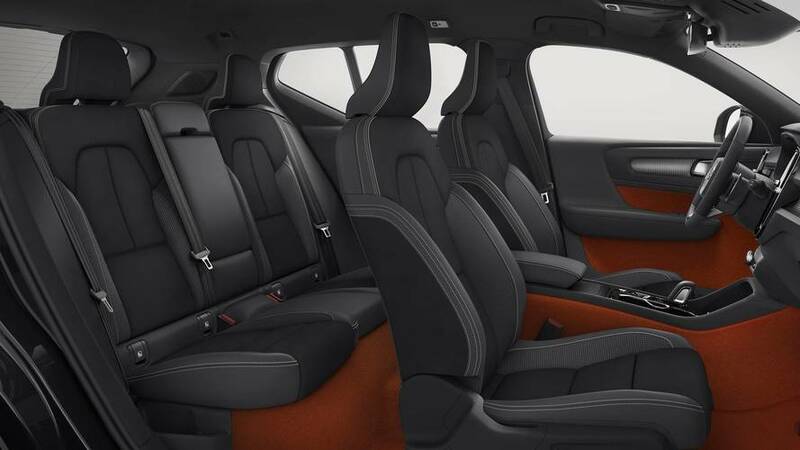 Volvo’s interior designers have managed to balance practicality with fun inside the XC40. There are no speakers in the front doors, for instance, to provide more storage space, and carpeting covers the inner door trim (rather than just plastic) to prevent belongings from rattling. On the other end, you can option wild orange carpeting if your eyeballs are so brave. It’s a roomy vehicle; my six-foot-tall co-driver has leg- and headroom to spare in the back seats, and I would even be happy to sit in the middle-rear space for short rides. The R-Design models available for my test drive look and feel expensive throughout, with contrast-stitched leather seats, aluminum dashboard trim, and switches that move with a precise click-click action. It’s a roomy vehicle; my six-foot-tall co-driver has leg- and headroom to spare in the back seats, and I would even be happy to sit in the middle-rear space for short rides. Most of the technologies and switchgear from the XC60 and XC90 trickle down to this model, meaning a full-color instrument cluster (it can show map directions or album art, for instance) and the super-simple Sensus touchscreen infotainment display. 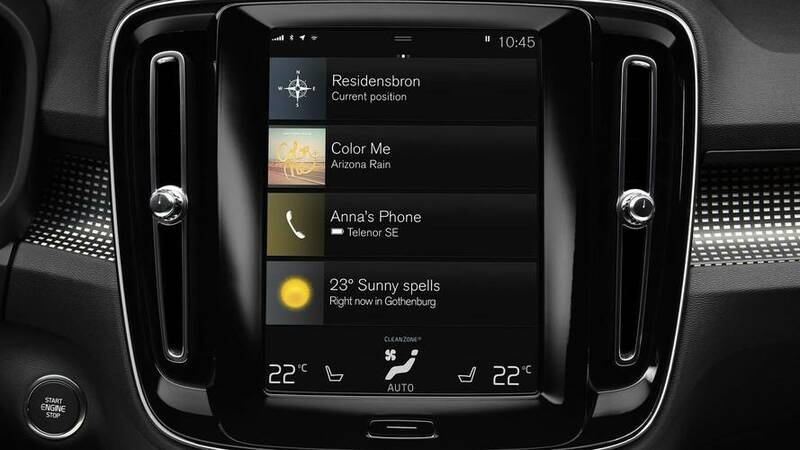 Climate controls and seat/steering wheel heating are handled on the touchscreen, so there are only a few physical buttons on the clean center stack; unlike in larger Volvo models, the engine start-stop button is on the dash by the steering wheel, not the center console. Sadly, this car also has Volvo’s dorky electric shifter, which requires two nudges to move from Park to Drive, or from Reverse to Drive. Ingenious storage solutions abound. There are slots to hold parking or access cards to the left of the driver’s knee, a parking-stub holder on the windshield, a removable trash can in the center console, and a fold-out hook on the glove box door ideal for hanging a purse, small grocery bag, or your take-out order. The door pockets will hold a 15-inch laptop (my MacBook Pro fit easily), and an optional storage bin beneath the driver’s seat is big enough for an iPad. 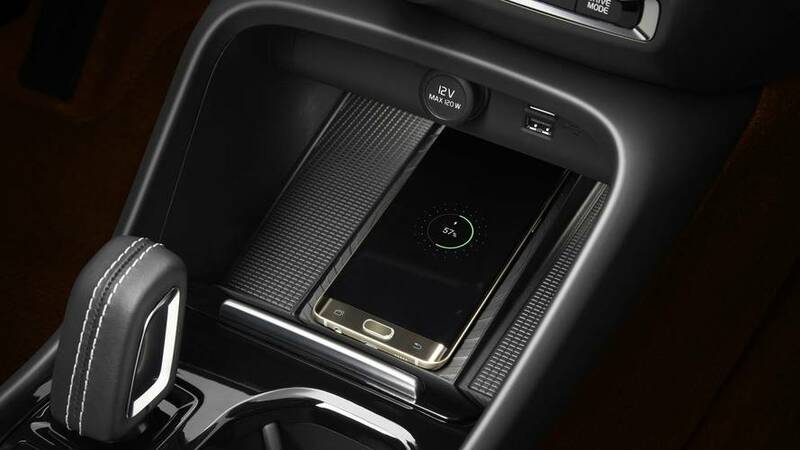 The center console was specifically designed to fit a Kleenex box, and the space ahead of the shifter, which optionally houses a wireless charging pad, is larger even for even the biggest of modern smartphones. The XC40 is the first Volvo with wireless phone charging, but in another sign of the times, it does not have an auxiliary audio jack or a CD player. There are some neat tricks for the trunk, too, where an optional fold-up floor can be raised to create a barrier closer to the seatbacks to keep grocery bags from wandering; it also has three hooks when raised for hanging more bags. It’s also possible to stow the parcel shelf upside-down underneath the trunk floor, which is far more convenient than having to stow it in the car or in your garage. Most of the technologies and switchgear from the XC60 and XC90 trickle down to this model, meaning a full-color instrument cluster and the super-simple Sensus touchscreen infotainment display. The cargo area is a roomy 20.7 cubic feet with the seats up. With them folded flat to the floor, that expands to 47.2 cubic feet. Volvo says there’s almost five and a half feet of distance from the front seatbacks to the liftgate. Those cargo figures eclipse what you’ll find in an Audi Q3 or Mercedes-Benz GLA250, but are slightly behind what BMW offers in the X1. The launch model in the U.S. is called T5, Volvo-speak for a 2.0-liter turbo-four engine, eight-speed automatic, and all-wheel drive. It’s a stout little powertrain, with 248 horsepower and 258 pound-feet delivered without fuss. Fleet on its feet when you put your foot down, the XC40 is also cool and collected in the city. You’ll rarely notice the transmission shifting, and power delivery is supremely linear. That said, there’s a lot of noise and vibration when the engine kicks back on after a stop-start moment at a traffic light. And the turbo mill plays a grim monotone at all speeds, though fortunately that fades into the background when cruising with the transmission in its top gears. Volvo officials warned that our test cars were the stiffest-riding models, with the R-Design’s upgraded springs and dampers and optional 20-inch wheels. Maybe it’s the sheer flawlessness of Spain’s roads, but the warning was totally unwarranted. With MacPherson struts up front and a multilink arrangement in back, the ride-and-handling mix is mature. The XC40 smooths out roads and doesn’t get unsettled over the few rough patches of pavement on our drive loop. The Momentum trim, on 18- or 19-inch wheels and its slightly gentler suspension tune, should be plenty plush – though I’ll reserve full judgement, as always, until trying the car on pothole-strewn roads back home. There’s a wonderful smoothness to the steering action, as if all the linkages slide on butter. What you won’t find is much steering feel, but that’s the same for this car’s rivals, too. As in a lot of new Volvos, the electric power steering has spot-on feel through its motion: easy to whip from lock to lock when parking, no unexpected changes in effort on the move, and lots of on-center stability. There’s a wonderful smoothness to the steering action, as if all the linkages slide on butter. What you won’t find is much steering feel, but that’s the same for this car’s rivals, too. In cut-and-thrust rush-hour traffic heading back to the hotel in Barcelona, I’m pleased to find the racy rear door styling doesn’t hurt over-your-shoulder visibility as much as I expected. Though there is a healthy blind spot in the rear quarters, the rear window large enough that’s it’s not a big deal. Plus, blind-spot warning and big mirrors mitigate worries in traffic. Base prices are competitive with rival crossovers. 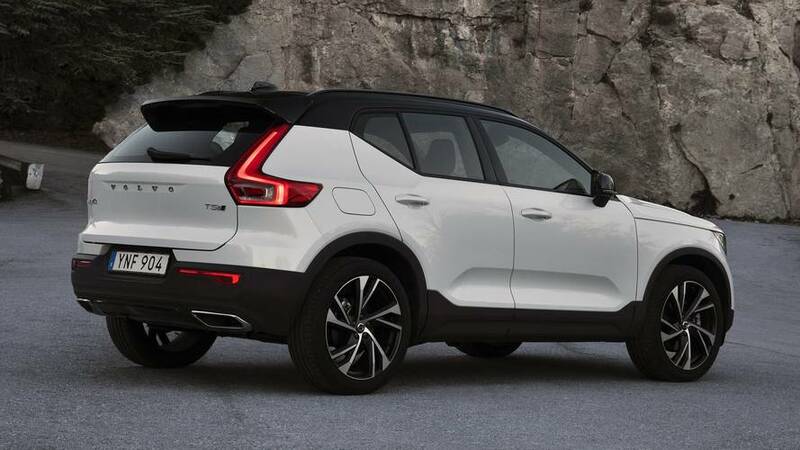 The XC40 T5 Momentum, which Volvo predicts to be the volume model, starts at $35,200 before destination. Standard goodies include 18-inch wheels, a power liftgate, LED headlights, a four-year subscription to the Volvo On Call telematics service with smartphone-based remote start, the 9-inch Sensus touchscreen and 12-inch color instrument cluster, and Volvo’s City Safety pre-collision braking system. The T5 R-Design starts at $37,700 and adds on mostly style features: a black-contrast roof, 19-inch wheels, a sports suspension tune, LED fog lights, an R-Design leather-wrapped steering wheel, navigation, a kick-to-open liftgate, various upgraded interior trim, and dual-zone climate control. Unlike some competitors, adding all the nice luxury features discussed here won’t necessarily break the bank. Options pricing is quite reasonable: The Vision package, which adds auto-dimming and power-folding mirrors, blind-spot warning with cross-traffic alert/braking, and self-parking with parking sensors, is just $1,100. The $995 Advanced package builds on top of that with a 360-degree camera, headlight washers, and adaptive LED headlights. The Premium package costs $1,400 on Momentum trims but only $900 on the R-Design, because it includes many parts from the R-Design spec, plus things like power-folding second-row seats, that clever foldable cargo floor, wireless phone charging, a storage bin beneath the driver’s seat, heated windshield wiper blades, and Pilot Assist adaptive cruise control. Stand-alones include a $1,200 panoramic sunroof, $750 for heated front seats and steering wheel, and $1,000 for an adaptive suspension (which won’t be available until late in 2018). All told, most shoppers could get a very nicely equipped XC40 for the mid-$40,000 range; my test car would have listed for $45,835 were it sold in the U.S. This isn’t a cheap car that’s been dressed up with some leather bits. It’s a car that was clearly designed from the start to be an upmarket experience. Lease rates are set to start at $325 per month for 36 months with $3,000 down. And there’s also the innovative Care By Volvo subscription plan, which costs $600 or $700 per month for 24 months and includes all insurance and maintenance costs. Read a more extensive explanation of the program here. After the T5 launches, the XC40 will also be offered in a T4 trim level with front-wheel drive. It still has a 2.0-liter turbo engine, but with a smaller engine that delivers just 185 hp. 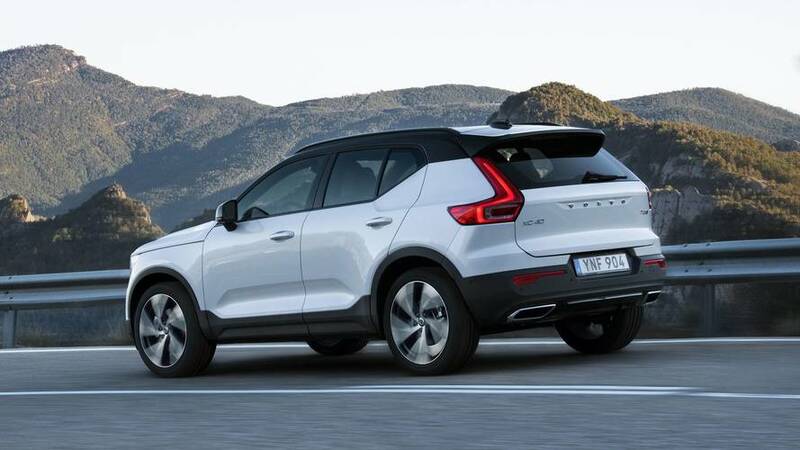 That model will start at only $33,200 in Momentum trim and $35,700 for the R-Design, although Volvo has yet to confirm what equipment will be offered on each version. 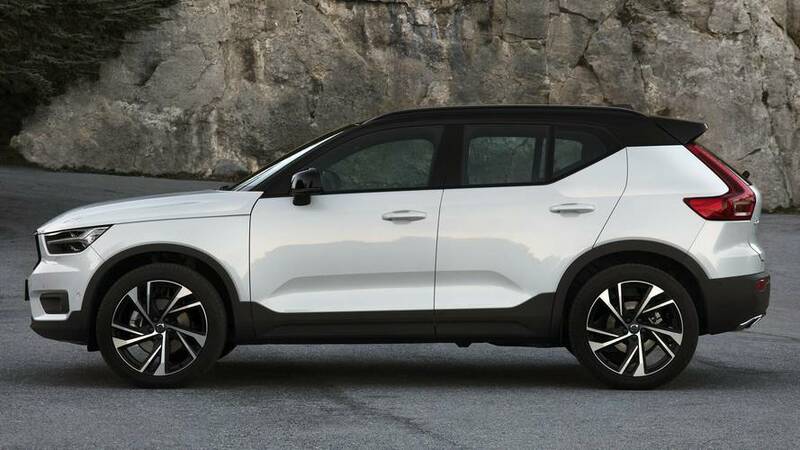 However you purchase it and whatever you pay for it, you’ll be extremely happy with the 2019 Volvo XC40. The car succeeds because it’s good at a little bit of everything. There is no shortage of clever places to store lots of stuff inside, great maneuverability in urban driving, and a useful complement of technology. Better still, the XC40 doesn’t skimp on any of the design, plush trim, or competent driving dynamics of its more expensive cousins. This isn’t a cheap car that’s been dressed up with some leather bits. It’s a car that was clearly designed from the start to be an upmarket experience.